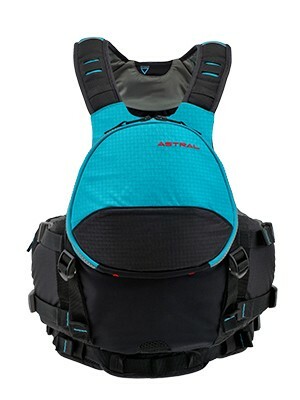 The BlueJacket by Astral is a PFD with a sea kayaking inspired design, but it is versatile enough that it will work just as well when doing flatwater fishing. It offers a great combination of lightweight construction, lots of storage as well as some technical features, while still offering a comfortable fit. One of the most impressive aspects of the BlueJacket is the Freestyle Tectonics system used by Astral. What it basically does is enable the outer front panel to move freely when you move your upper body, but without the inner panel shifting. This means you have the freedom to paddle or cast without interference, without having to worry that the inner panel won’t stay in place. Anglers will appreciate the clamshell front pocket that is not only easy to access, but also has internal zippered pockets and organized slip pockets for added convenience. Even with all this space, the BlueJacket remains looking sleek and has a very streamlined feel to it. It uses a side-buckle entry system and, thanks to eight adjustment points, is sure to fit comfortably. This is also a great PFD for colder days as it has fleece-lined hand warmers. 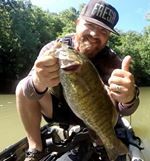 If you are the type of angler who spend a lot of time out on the water, then there are a couple of additional features that the BlueJacket has that are noteworthy. The most important is the hydration sleeve, which is located at the internal back. A reservoir can be purchased separately and then you have the option of routing the hose to either shoulder of the PFD. The BlueJacket also has support for a strobe light attachment that can be purchased separately if you require additional visibility. Even without the attachment, the reflective accents on the PFD will make you more visible in low light-conditions. The Astral BlueJacket only weighs 2 lbs, but has 15.5 lbs average flotation and is a great choice if you want a quality PFD that also looks very stylish.